The Times Square Show, June 1980, is often referenced as a groundbreaking exhibition that inaugurated new trends in contemporary art. To date, the TSS&apos;s specifics are known almost exclusively through accounts from the established art press, either published during the show&apos;s run or its immediate aftermath. 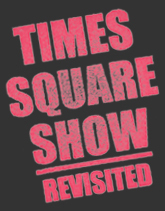 Times Square Show Revisited is the first exhibition to return to the original events of 1980 in an attempt to situate TSS within its proper historic context, to understand the origins of the TSS and to recover missing elements vital to comprehending the show&apos;s multidisciplinary program, which created an immersive experience of the downtown New York environment. At the time, the gestalt of the show was understandably overwhelming for many who viewed it, a quality unique to the original exhibition and impossible to replicate through any contemporary restaging. In this spirit, TSSR features works shown at the TSS, in addition to ephemera and documentation of the original exhibition. The varied character of the works presented in TSSR reflects the dissonances and synergies that coexisted within the downtown community of artists in 1980, when rents were cheap and local artist haunts such as the Mudd Club and Club 57 thrived on the dynamic social milieu. TSSR assembles work from approximately forty artists, only a fraction of those involved in the original exhibition, in an effort to offer an opportunity for dialogue and to promote further inquiry around this rich topic. To this end, TSSR presents a collection of thirty interviews that contribute to the historic record of this pivotal artistic moment in New York City. While the sometimes scrappy—and often striking—aesthetic of the works presented at the TSS was not stylistically coherent, the diverse themes drew from a pool of contemporary, shared experience. Downtown artists in 1980 bore witness to a nation recovering from the volatility of the seventies: the Watergate scandal, Nixon&apos;s resignation, and the Vietnam War.1 In conjunction with these political landmarks, the end of mid-century prosperity was signaled by the economic recession of the mid-1970s that saw high unemployment paired with rampant inflation.2 Hit hard by the recession, New York City faced bankruptcy but found no hope of federal support. The New York Daily News headline, "Ford to City: Drop Dead," on October 30th, 1975, embodied the rough fiscal road ahead for New York City.3 What this meant for downtown artists was a neglected neighborhood full of real violence and danger, where inexpensive lofts were plentiful but landlords were notoriously negligent. In this unstable environment, young artists formed a community in which possibilities abounded. The idea that there was nothing at stake—and thus nothing to lose—opened up the culture to frenetic social exchange where music, art, film, and fashion took on their own identities apart from trends dictated by industry standards. The ability to take risks broke down boundaries and encouraged collaborations among artists who experimented by combining traditional mediums with new media, forming collectives and challenging the accepted modes of making and showing their art. In this context, the TSS can be understood as an exhibition that introduced expressive forces in contemporary art that, decades after, continue to permeate and influence trends and practices in making art. For many young artists living and working in downtown New York at the end of the seventies, established institutions, galleries, and even so-called alternative spaces seemed closed to artists with no foothold in the art marketplace. They instead looked to the complex and vibrant environment in which they participated on a daily basis, as the cool, analytical nature of Minimal and Conceptual art seemed removed from their quotidian experiences and developing concerns. It was clear that an investigation of new ways to communicate with an expanded audience was needed to reach beyond the elite art-world system. These young artists hungered to re-insert enjoyment and fun into art. And breaking the rules was necessary. Punk-style rebellion against the staid aesthetic of SoHo’s artistic milieu and the museum circuit emerged. Where figuration, object-making, cartoons, and lowbrow art forms were eschewed by the commercial and institutional art world, these genres were embraced by young artists who made work with (and for) their friends. This impulse exploded in the large-scale presentation of the Times Square Show. The Times Square Show was staged during June of 1980, at the corner of 41st Street and Seventh Avenue in New York City. In the barrage of media attention that was to accompany the exhibition&apos;s run, Village Voice writer Richard Goldstein heralded the TSS as "The First Radical Art Show of the 80s. "4 Instead of a carefully controlled environment, the viewer experienced a profusion of art and activity contained within a maze of rooms and hallways that took up all four floors plus the basement of a vacant building that formerly housed a massage parlor. There was no pristine, white-walled gallery space and no obvious, systematic way to identify the individuals who made the works on view. Conceived by artists associated with the group Collaborative Projects (aka Colab), the month-long exhibition presented a program of art, music, performance, video, and fashion. More than one hundred artists were involved in creating both planned and unsanctioned artworks, performances, and actions during the exhibition. The Times Square Show stands as a testament to the themes and experiences embodied in the "old Times Square," a reminder of the location as a center for New York&apos;s cultures outside of the mainstream marketplace. Collaborative Projects, along with all of the artists connected to the Times Square Show, seized the location on the cusp of its transformation to stage an epic intervention that would have been impossible only a few years later. Formerly a liminal space for alternative cultures, Times Square today no longer has the appeal it did in 1980. The old Times Square could be perceived as either dangerously seedy or inspiring, depending on one&apos;s own social position and desires. Times Square&apos;s gritty, freewheeling character has been replaced by clean commercial purpose and standardization, creating a veritable shrine to corporate American culture and consumerism. In 2012, the corner of 41st Street and Seventh Avenue is dominated by a forty-story glass-and-steel skyscraper, also referred to as 5 Times Square or the Ernst and Young Tower. At street level, a Red Lobster chain restaurant anchors the office complex. Despite these changes, the Times Square Show of 1980 remains a significant hallmark of artistic transition. Occurring at a moment when artists embraced new possibilities and modes of art-making, the exhibition dispelled the notion that art needed permission to be made and exhibited. The Times Square Show crystallized a moment in the history of New York, in which the drive to do-it-yourself and a group of like-minded friends made the improbable possible. 2 Albert E. Schwenk, "Compensation in the 1970s," United States Department of Labor, Bureau of Labor Statistics, http://www.bls.gov/opub/cwc/cm20030124ar05p1.htm (accessed January 9, 2012). 3 This headline has been quoted in many places as characteristic of the time. Despite these prior references, the headline maintains its relevance for many artists when describing their relationship to the economic context that contributed to their own activities. 4 Richard Goldstein, "The First Radical Art Show of the &apos;80s," Village Voice, June 16, 1980, 1.